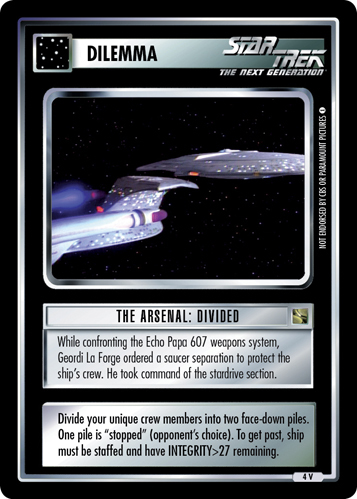 While confronting the Echo Papa 607 weapons system, Geordi La Forge ordered a saucer separation to protect the ship's crew. He took command of the stardrive section. Divide your unique crew members into two face-down piles. One pile is "stopped" (opponent's choice). To get past, ship must be staffed and have INTEGRITY>27 remaining.